The first wave of artists for Dot To Dot Festival has been announced and Getintothis’ Howard Doupé is here to join up the dots. Dot To Dot Festival has announced The Horrors as headliners for 2018, along with the first wave of artists to play the festival held over the last weekend in May. After record breaking sale last year and scooping Winner of Best Festival For Emerging Talent at last years UK Festival Awards, Dot To Dot returns for 2018 to take over Manchester (25 May), Bristol (26 May) and Nottingham (27 May). Always a supporter of emerging talent, Dot To Dot is pleased to welcome 25 year old Irish newcomer Dermot Kennedy to this year’s event. With his debut EP clocking over 80m streams, Kennedy is regularly compared to Bon Iver, this will be his debut performance at Dot To Dot. The Manchester band Pale Waves have had a meteoric rise to date; not to mention their BBC Sound of 2018 nomination. Part of the Dirty Hit label (The 1975, Wolf Alice), the band have released one EP to date, and with their debut album planned for later this year, a promising future lies ahead. Joining the three main acts are Marika Hackman, Mahalia Music, Turnover, Bad Sounds, Gus Dapperton, The Regrettes and Cassia. Also announced are Adam French, AKA GEORGE, Arlo, BEXEY, Bully, Connie Constance, CuckooLander, Daniel Alexander, Daniel Docherty, Devon, Easy Life, George Glew, Grand Pax, Haiku Hands, Helena Deland, KAWALA, Kyle Craft, Lionofficial, Malena Zavala, Men I Trust, Noah Kahan, Our Girl, Peter Oren, Puma Blue, SHADOWPARTY, Skegss, Soham De, Sports Team, The Kite String Tangle, The Mysterines, The Snuts and Winston Surfshirt, plus more to be announced. 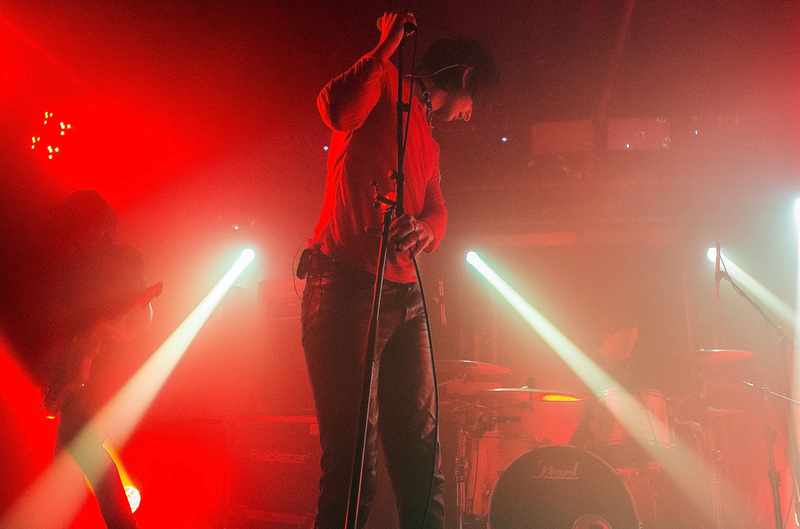 Festival organiser Anton Lockwood, said: “We’re delighted to welcome The Horrors to headline 2018’s Dot To Dot Festival. Over the course of 5 albums their relentless creativity has produced some of the best music the UK has to offer, and it’s great to have them at the UK’s most forward-thinking city festival. “Beyond The Horrors, really the festival is about new music, and our other two main headliners are new artists destined for huge things. Pale Waves and Dermot Kennedy are both rising fast and we’re very excited to bring them to you just as they reach a wider audience. Of course, as befits an event that last year was recognised as the Best Festival for Emerging Talent, we also have an array of the finest brand new artists which will be announced very soon. 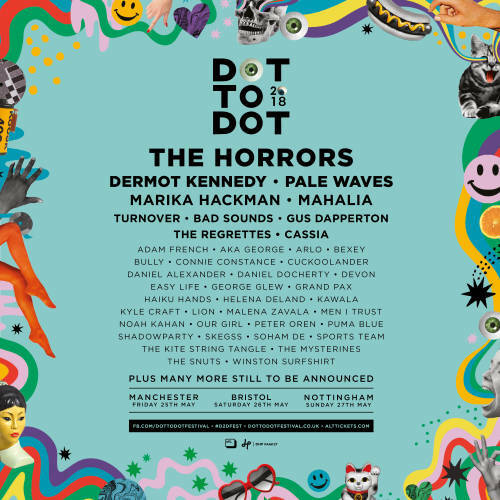 Dot To Dot festival takes place in Manchester, Bristol and Nottingham May 25-27.